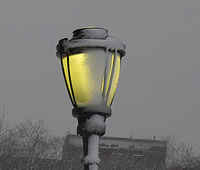 Hybrid Streetlights: Good Or Bad News For Utilities? Urban Green Energy — a New York City startup that designs and manufactures small wind turbines — has released and installed the first of its new, “hybrid” or wind- and solar-powered streetlights. 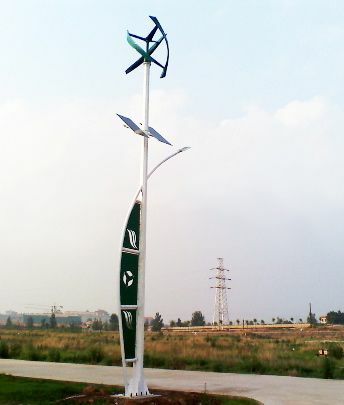 Designed for primary use in parking lots or over highways, UGE’s Sanya streetlights include a standard setup of the company’s 600 W Eddy wind turbines, along with a steel tower or pole, solar panels, lead acid batteries of the variety used in many cars, controls and light emitting diodes (LEDs) made by suppliers from Asia and the U.S. They can store up to 5 days of power, and can be customized to cast a particular color of light according to the product’s official webpage. The UGE Sanya could take some business away from utilities by generating power from off-the-grid renewables for use in the pervasive, on-all-night streetlights. In many U.S. markets today, electric companies are the ones who actually install, maintain and power communities’ residential streetlights. This traditional business model has caused problems recently for various municipalities and utilities that serve them. In Fayetteville, North Carolina (as reported by Andrew Barksdale for The Fayetteville Observer, N.C.) Progress Energy (NYSE: PGN) is threatening to turn the streetlights off, unless the town pays a bill over $100,000 there, or gives PE permission to charge monthly fees to customers it serves in the area. It’s even worse in Lawrence, Kansas (as reported by Chad Lawhorn for the Lawrence Journal World & News). The city’s auditor, Michael Eglinski, believes the power company in charge of streetlights there, Westar Energy, is overcharging Lawrence for electricity it provides, failing to meter precisely, and worse is using woefully inefficient bulbs deliberately to boost sales. Consumers can’t turn streetlights owned by utilities on or off, nor can they swap out old bulbs for highly efficient ones. The arrangement doesn’t feel fair to every resident. Utilities’ sympathizers, on the other hand, point out that they are responsible for things like repairing street lamps should a tree branch or car accident take one out, and incur other costs to keep cities safely lit. The UGE Sanya streetlights could provide one benefit to utilities, though. Since they’re grid connectable, the lights can send excess power from the wind turbines and solar panels back through the grid. That helps utilities fulfill regulatory requirements to increase the percent of power they get from local, renewable sources. Nick Blitterswyk, founder and chief executive of UGE, said more than 100 Sanya streetlights sold in the product’s first month on the market. None of Sanya’s buyers so far have been utilities in the U.S. Queries have come from municipalities, retailers and hotels eager to illuminate their properties, cut electricity costs, and win a green public image. A mechanical engineer at UGE, Mateo Chaskel, said that the constantly moving turbine technology in the lights should last twenty years, requiring just an annual maintenance check-up, barring natural disasters or accidents. Not including the batteries, the LED lights and other parts within should endure as long as the turbines, he said. He hopes they’ll reduce waste from spent bulbs, along with maintenance costs for companies, cities and utilities that switch to the Sanya. The streetlights are assembled at a UGE facilitly in Asia, and shipped to San Francisco for distribution in North America. They usually qualify for a 30% rebate from the federal government. The city of San Francisco recently installed the hybrid lights as part of Mayor Gavin Newsom’s sustainable civic center efforts. More recently, Chaskel said, they were installed in about five sites in Pusan, South Korea. They will soon be installed in lots and along city streets in: San Jose, Oklahoma, Ohio, the Virgin Islands, Australia, and Poland. TCTV took a look at Urban Green Energy’s small wind turbines at the Consumer Electronics Show. Check out the clip, below!